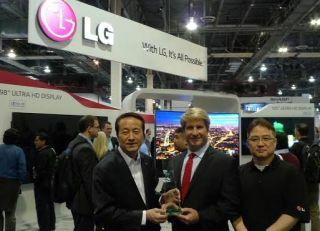 LG Electronics USA expanded its Ultra HD large-screen commercial-grade monitor line-up for 2014 by unveiling Wednesday at the Digital Signage Expo 2014 (Booth 500), their new 105-inch class display, their largest commercial screen to date. LG’s new edge-lit LED LCD Ultra HD Display features a 105-inch class screen with a 21:9 aspect ratio and 5120 x 2160 (5K) resolution. “Ideal for retail settings,” according to LG, the 105-inch Ultra HD 21:9 commercial display has five times the resolution of a Full HD display, "for crisp pictures with an incredible level of detail." LG’s 105-inch ULTRA HD display also offers installation flexibility— it can be oriented vertically in portrait mode or horizontally in landscape. Joining the 105-inch class Ultra HD commercial display at the show is another notable display from LG’s ULTRA HD digital signage lineup, the 98-inch class 98LS95A. The Ultra HD digital signage display delivers 3840 x 2160 resolution in a 16:9 aspect ratio. The 98-inch Ultra HD display has a bezel width of just 14.6mm and may be mounted in portrait or landscape mode for optimal use in a wide range of commercial applications. Both the 105-inch and 98-inch displays are equipped with a proprietary chip that optimizes image quality. This upscaling function takes SD, HD or Full HD content and renders it in sharp detail on the Ultra HD screen. Both displays can decode H.264 and HEVC H.265 at 30p or 60p. It can display Ultra HD content from nearly any input source, including HDMI 2.0, USB and LAN. An image with 8 million pixels and enhanced by LG’s IPS (In Plane Switching) panel technology enables optimal color saturation and contrast for off-angle viewing (both horizontal and vertical). IPS technology also provides a screen surface temperature tolerance of up to 230 degrees Fahrenheit (110 degrees Celsius), which helps alleviate a common problem with screens overheating and, as a result, suffering from permanent picture quality damage.